when i found myself on the main dance floor of about blank during berlins most beloved party, buttons, i was immersed by the sounds of shingo suwa. he has honed his skills as a resident dj and producer for many years. in this record, you will hear how his experiences have heavily influenced his productions. 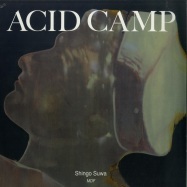 we are excited to release shingos debut album and the first album released by acid camp records. 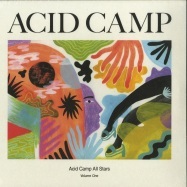 the album includes a bonus remix from mixmaster eric cloutier. catch shingo and i reunited for our tour of japan this august. 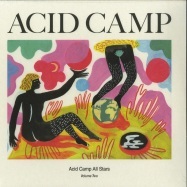 the all star team at acid camp has been touring around the world in search for inspiration. theyve created new and engaging tracks for you to share with your favorite dance floor or your private listening environment of choice. find part one and two of our new series at your favorite record shops. 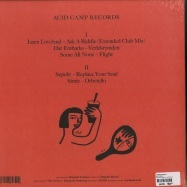 a limited run of colored vinyl will be available at acid camps bandcamp. 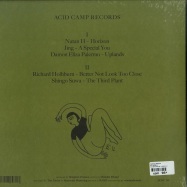 this record definitely takes a bit more of a layered approach - natan h offers us yet another unique, immersive, and charismatic release for acid camp records. 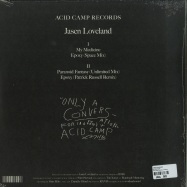 acid camp records is rolling through again, this time with an artist known for his atmospheric and cosmic-oriented tracks, natan h. conveying inspiration for this record, just a little nod to extrasensory experiences and perception, is undoubtedly fitting for acrs second release. the opening track, atmosphere, breaks away from 4/4 timing with o-kilter drums that traverse into a heavier beat, pushing the track forward just to bring it right back at the end. followed up with a remix from techno serialist, conforce. through his use of a low pass filter, polyrhythms, and fervor conforce delivers a track nothing short of the prototype for driving techno. remote view pt. i turns out an ambient break and taking the listener to a space of the ethereal and planetary. the ep closes with remote view pt. ii, which incorperates layers of hi-hats, delayed strings, and synths that alternate throughout the arrangement in syncopation. 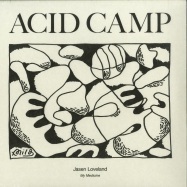 jasen lovelands prescriptions are strong and may not be suitable for all patients inquiring. 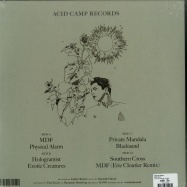 these formulations were created in assistance from bmg, silent servant, and a new and improved mix by patrick russell, phd. a full dose of all four medications should not be administered without the help of a certified professional. for more information please feel free to call the acid camp hotline at 1-800-ami-high. 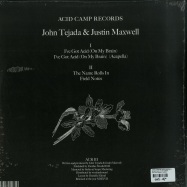 next up on the docket for acid camp records is a record created by duo john tejada and justin maxwell. 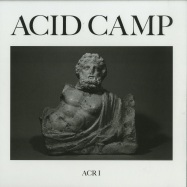 the pair came together to make acr iii with two things in mind: creating sounds that put a smile on their face while possessing as much character as possible. 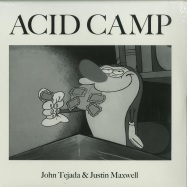 the opening track, -i ve got acid (on my brain)- is a mind-bending wavetable freakout, the likes of which tejada and maxwell have been striving to do for years. using a vintage ems vocoder to create an original vocal sample, this track is bright, playful, & vivacious. -the name rolls in- is layered in an acid playground of sounds. a rhythmic track with a potent 303 bass line, prominent percussion, and that infamous vocoder back at it to create a distinctly groovy track. -field notes-, is a composition of celestial arrangements that is completely beatless. carried through by tiers of sounds, filters, and noisier elements, this track lulls the listener into an alluring sonic dreamscape. 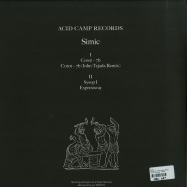 los angeles based acid camp records launches now with its debut release, simics: corot-7b. the seattle-based artists full-length ep, features four original tracks along with a remix of the records single corot-7b by john tejada.